The Pacific Blue Cross Board of Directors is pleased to announce the appointment of John Crawford as President and Chief Executive Officer of Pacific Blue Cross, effective immediately. 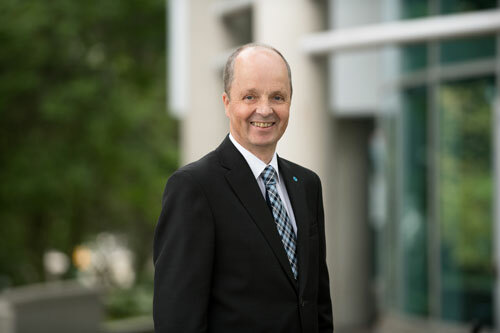 As a part of the Pacific Blue Cross family for three decades, John has been instrumental in continuously improving financial systems and business processes to enable Pacific Blue Cross to better serve the health care needs of British Columbians. Prior to being named Interim President and CEO in November 2017, John was the Chief Financial Officer and oversaw tremendous growth in the organization throughout his tenure. Known for his community spirit and outstanding contributions to the Canadian insurance industry, John also dedicates significant time to volunteering. The 2018 BC CFO Awards, presented by the Chartered Professional Accountants of BC and Business in Vancouver, recently honoured John with their first Lifetime Achievement Award in recognition of his philanthropy and professional success. Richard Taylor, Chair of the Pacific Blue Cross Board of Directors, explained that “As Interim President and CEO, John has reinforced a strong financial foundation while improving member value. Under John’s leadership, Pacific Blue Cross will continue to work with our clients to serve the health care needs of our members while growing the business for the future.